During the African Green Revolution Forum this week in Arusha, Tanzania, IFAD President Kanayo F. Nwanze was the keynote speaker at a high-level panel on making African markets work. Excerpts from his address follow; read the full speech here. Today, there are unprecedented opportunities in African agriculture. Africa has the fastest growing population and the highest rate of urbanization in the world. The middle class is growing across the continent, driving demand for food…. And Africa has the greatest potential to reduce poverty through smallholder agriculture. Small farms, of 2 hectares or less, represent 80 per cent of all farms in sub-Saharan Africa. They contribute up to 90 per cent of production in some countries. These small farms have the potential to be key suppliers to Africa’s growing urban markets as well as rural market. And we know, from many studies, that GDP growth generated by agriculture is at least twice as effective in reducing poverty as growth in other sectors. As the multinationals have noticed, the outlook for African food markets is bright. The demand exists, and is growing, for quality, for variety and for processed foods. This means new and exciting possibilities for the agro-industrial sector. But is the African agricultural sector ready to take advantage of these opportunities? I am sad to say, it is not. Where are our roads? 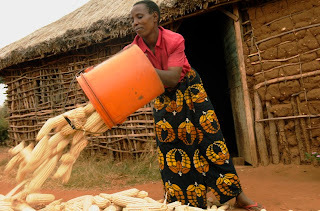 Where are our farming communities with reliable access to electricity and running water? Where are our warehouses piled with golden maize? Where is the good governance that would make doing business in Africa attractive? If we want to make Africa’s national and regional markets work. If we want to ensure Africa’s food and economic security, then we must transform our infrastructure and the way we do business. And this change must come from within…. We know that in Africa, smallholders can contribute to food security, economic growth, landscape management and wealth creation if they are able to participate in national and regional markets – if they have well-functioning infrastructure, and supportive polices. Smallholders who can participate in markets have an incentive to increase production. At IFAD, we see time and time again the production improvements that occur when smallholders have secure access to land and water. When they have financial services to pay for seed, tools and fertilizer. When they have the technology to receive market information on prices. And when they have the knowledge and policies to produce in ways that maintain ecosystems and minimize vulnerability to climate change. Smallholders also thrive when they are organized into strong organizations with greater bargaining power in the marketplace and the ability to influence national, regional and global agricultural policies. Indeed, IFAD’s experience repeatedly shows that smallholders can be strong domestic and even regional market suppliers when they are part of strong farmers’ organisations. Let us not forget that smallholders, and farmers in general, are the biggest on-farm investors in agriculture in developing countries. They invest not only their own money but also their time and labour. Africa can feed itself. Of this I am sure. I have seen it with my own eyes on field visits in Ghana, in Rwanda and in Zambia. By working in partnership to create opportunities for Africa’s smallholders, supported by a true and deep commitment by governments, I look forward to the day when I can say that African markets are working and Africa is feeding itself. We owe it to the quarter of a million children in the Sahel who die of malnutrition, even in good years, and to each and every man, woman and child on our continent who wants to build a bright future for themselves, here in Africa.